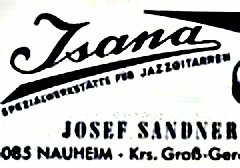 From 1951-1974, Josef Sandner hand-built ISANA guitars in his 'Specialist Workstation For JazzGuitars' in Nauheim, Near Frankfurt, Germany. 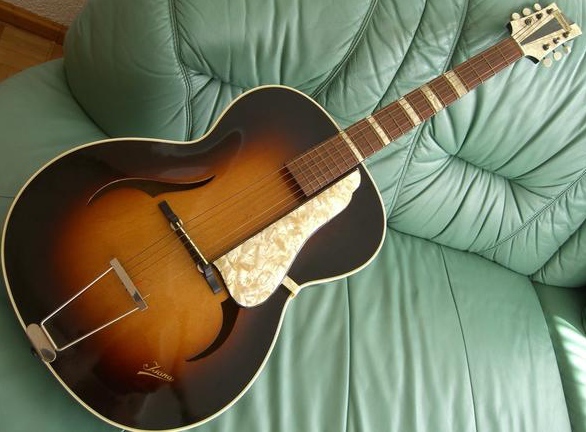 Several models were produced, but the most desirable is the stylish Black Archtop owned by Elvis Presley whilst stationed a few miles away in Bad Nauheim, near Frankfurt, Germany 1958-1960. 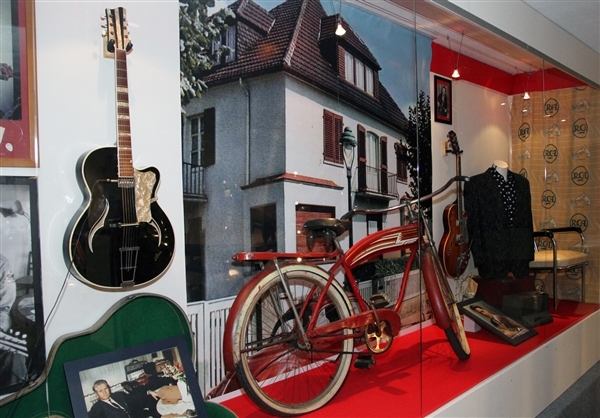 "Elvis' father Vernon bought an 'Isana' guitar at the music shop 'Hummel' in Frankfurt on 12-20-1958, a noble instrument finished with black piano lacquer at the price of DM 225,00, and gave it to Elvis as a Christmas present. 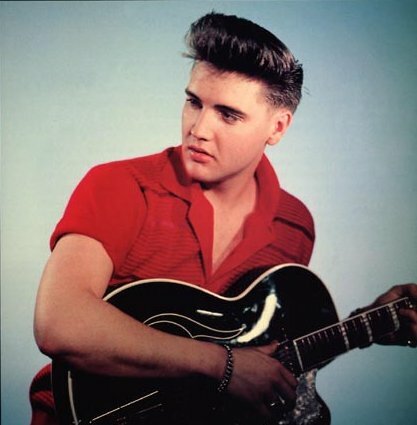 Later Elvis added a floating neck pickup to the instrument and played it through a Dynacord amp." 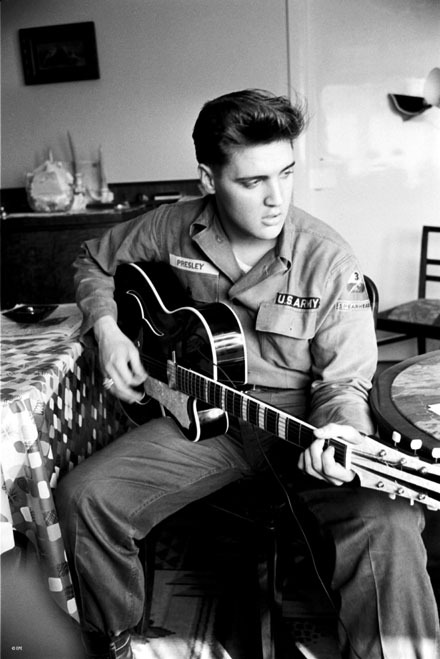 For many years (pre-c.2004) this guitar's maker was notoriously unidentified in the Elvis fan and guitar collector worlds. 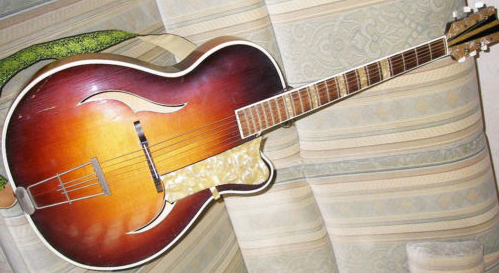 In 2006, an Isana alleged to be Elvis' personal guitar came on the market, being at that time mistakenly termed a 'Jsana' through a mis-reading of the company logo. A fanciful press-release from the time claimed it to be 'possibly the only remaining example in the world'. 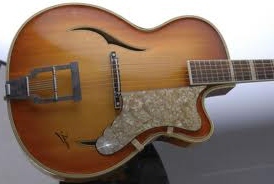 This guitar with it's dubious provenance repeatedly failed sell when offered by Heritage Auctions. 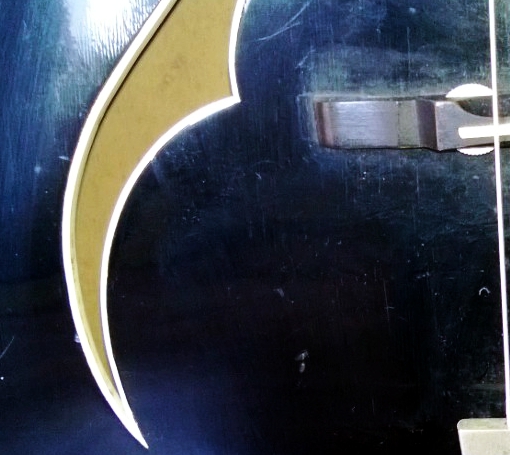 It was subsequently loaned for display at the Memphis Museum of Rock 'n' Soul. Month and Year of manufacture is ink-stamped (quite small!) 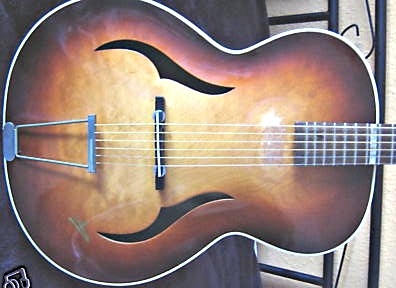 inside the Archtop models, on the inside face of the backplate, directly beneath and visible through either (or often both) soundhole(s). It is usually very faded and faint, and hard to locate and read - try using a very bright torch! 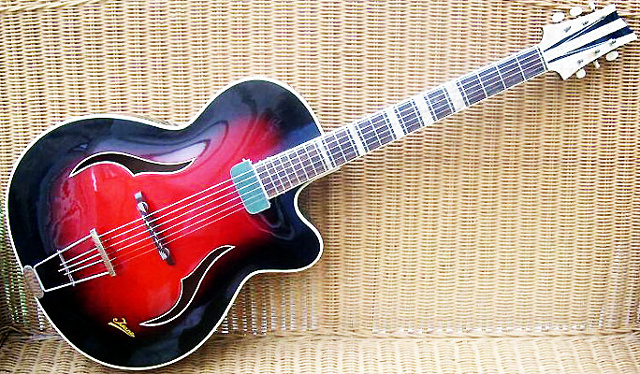 Since the known production date of the 'Elvis' model spans 5 years (OKT 1956- MAI 1961), it seems a reasonable guess that a maximum of 1000 of this model may have been built, perhaps less than one fifth (200 examples) in black. 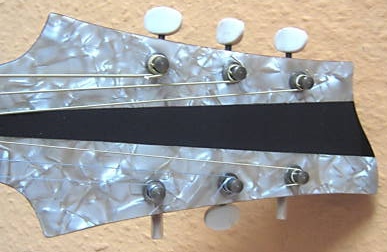 The most common finishes appears to have been the Red-black or Orange-Black Sunburst, with slightly less in Tobacco Brown Sunburst or Orange Sunburst. 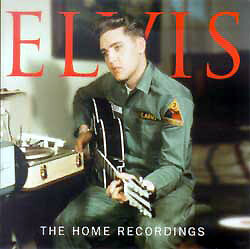 Only a very few examples (I know of seven including Elvis') have surfaced in Black finish. None are yet known to me in Blonde or Natural finish. 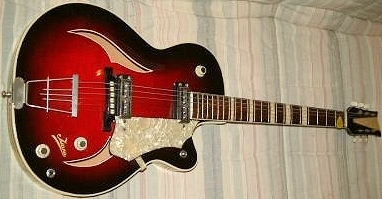 However, there are also many other similar guitars that display Isana-like features, but which bear no branding, or a variety of other names, such as 'Oscha', 'S und S' - It was common practise for a distributor or even the original seller's shop to add their own perfectly professional-looking decal labels to guitars in these days, so the situation is by no means clear cut. Years as 'stated' may refer to a model produced for several years either side of that date! 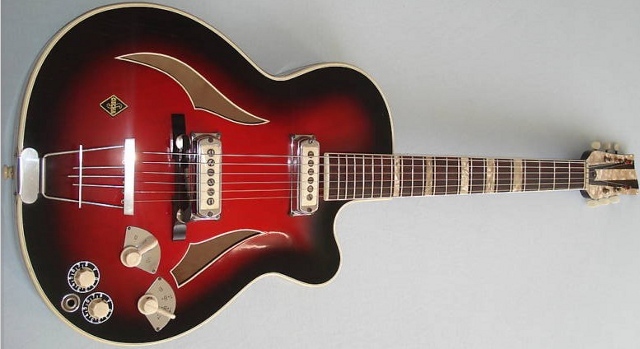 I have tried to sort the pictured guitars chronologically according to known date stamps, correlating the stylistic changes with popular trends in guitar design. 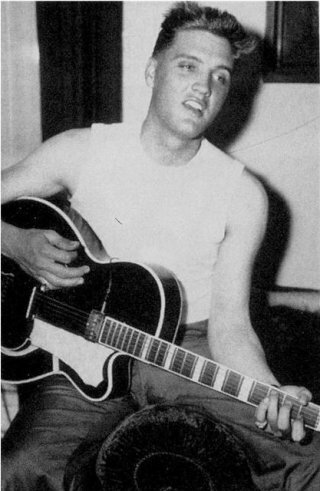 Dated Sept 1954? or 1956? 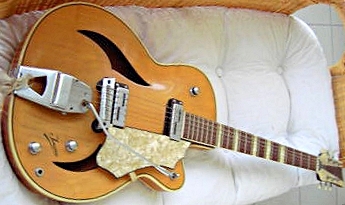 Similar cutaway model, but different tailpiece and pickguard shape. 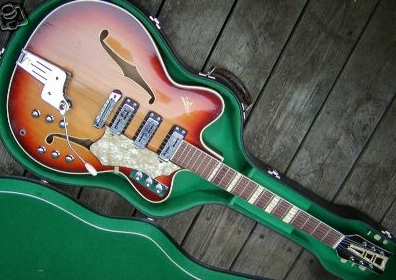 Are these Budget non-trussrod Acoustics from the mid 1960s, or a decade earlier?